Not everyone wants to tear down Valve’s Steam service after its messy venture into paid mods. Last Thursday, Steam announced that modders could charge for their work through Steam Workshop. Conflict immediately erupted: Mods had always been free up to now, and there were ethical and legal questions around paid mods, too. Despite the initial furor, some PC gamers think Valve’s plan for paid mods could still work with some tweaking. After all, some developers spend years modifying PC games to create entirely new experiences, and could surely use financial support along the way. This suggestion comes from a Reddit user who worked on the Eternal-Silence mod for Half-Life 2. 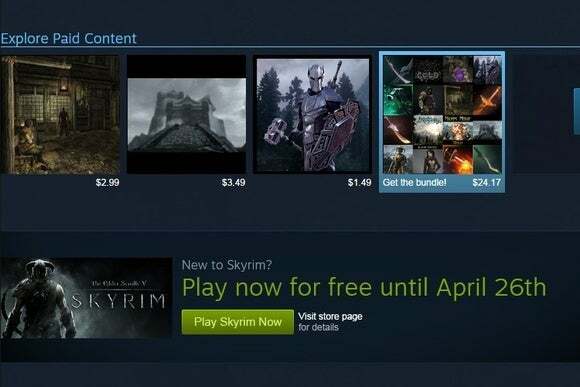 Instead of opening paid mods to anyone—and therefore inviting exploitative junk—Valve could require developers to establish a track record first through free or donation-based pricing. After a certain amount of downloads and high-enough ratings, developers would earn the right to sell paid mods. “Maybe this would be too unfair, but the root of my concern is that there needs to be a trust relationship between the mod author and their customers,” Reddit user Iced-Eagle wrote. One concern with paid mods is that they could break if the main game gets updated, and get-rich-quick schemers may not bother with ongoing support. One solution, suggested by Reddit user Garod, would require a “Version Compatibility” listing for mods, and suspend paid mods that no longer work with the latest version of the game. Creating this system may be difficult, but it would give players peace of mind. Steam already has a robust system for user reviews. But currently, this system applies only to standalone mods that are essentially new games. Mods that tweak an existing game (for instance, with graphics enhancements or new weapons) don’t allow the same level of feedback. As this suggestion on Imgur notes, the community could be a powerful form of quality control. 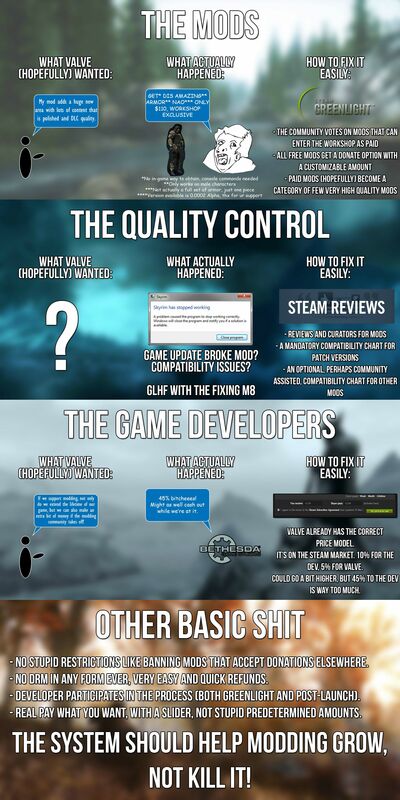 Valve is catching a lot of flack for the measly 25 percent cut that goes to modders of The Elder Scrolls V: Skyrim. While Valve’s Gabe Newell has insisted that publishers should be free to set their own pay rates for modders, Iced-Eagle suggests a sliding scale so that players can decide how to distribute their money. Perhaps publishers would still set the floor, but at least this system would add transparency, giving players a better idea of what their money is actually supporting. The Steam community’s still stewing over paid mods, so we’ll keep an eye on how things play out. What do you think? Would you be willing to accept paid mods with some of the suggested changes above? Let us know in the comments.